The world's population is growing at remarkable speed. In 2000 it was around 6 billion. In 2050, based on estimates from the United Nations Commission on Population and Development, it will be 9 billion. An already crowded planet will have half as many people again. Few countries face as big a challenge as India. It is already the world's second most populated country with over 1.1 billion people, not far behind China which has 1.3 billion. But China's population is expected to level off in the coming decades because of the government's one-child per family policy. India's population will keep on rising and the UN expects it to reach around 1.6 billion by 2050, by which time it will have overtaken China to become the world's most populated country. Visiting Mumbai, India's biggest city, it already feels like the most crowded place in the world. At the railways stations trains arrive with packed carriages and passengers hanging perilously outside the doors. Outside, the traffic is permanently jammed in a mass of hooting taxis. And perhaps none of this is surprising. 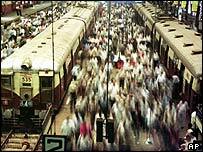 In 1975 Mumbai's population was 7 million. Now it is one of the biggest cities on earth with around 19 million inhabitants and a transport infrastructure which cannot keep pace with the increase. 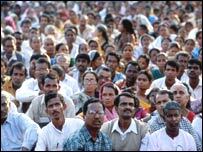 The rises in population in India have largely been caused by people living longer. In 1947, when India became independent from British rule, average life expectancy was just 33 years. Improved living standards and healthcare have raised that figure to the mid-60s. At the same time birth rates have been falling. But the reduction has not been fast enough to prevent the overall population rising rapidly. And it is often the poorest families which have the most children. Asha Rane is well qualified to understand why poverty breeds big families. 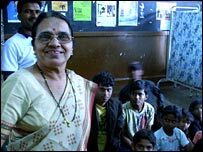 She was a professor at the Tata Institute for Social Sciences and now runs the Hamara Club, a project which helps children living on the streets of Mumbai. She explains the growth in terms of "one mouth and two hands". A child is another mouth to feed but will provide two hands to help work and bring in money for the family, especially as the parents grow older. India was the first country in the world to introduce a national family planning programme. In the 1970s there was huge controversy over accusations that men had been coerced into having vasectomies. But the work of persuading people of the benefits of planned pregnancies has been carried on in recent decades by people like Dr Suhas Pophale. He describes the efforts to promote family planning as "a drop in the ocean" and goes on to explain the reasons to do with culture, religion and lack of education which have created a big divide between the high birth rate among India's poor families and the much lower birth rate for middle class women. So, for a complex set of reasons, India's population will rise inexorably over the next fifty years. Will the country be able to cope with another 500 million citizens by the middle of the century? There will certainly be difficulties, according to Professor Tim Dyson, co-author of Twenty-first Century India. One of the biggest challenges will be the supply of water. Agriculture uses most of India's fresh water. If India is to feed a population of 1.6 billion it will need to dramatically increase its agricultural production. But there will be no more available fresh water in 2050 than there is now. Indeed there may be less because of the effects of industrial pollution. Montek Singh Ahluwali, deputy chairman of India's influential Planning Commission, argues that India can eventually provide for a population of 1.6 billion. "Resources at the moment are very sub-optimally used," he says. "I think it's possible to manage that kind of population provided there is a systemic change in how we deal with resources which are becoming scarce. The scope for increased efficiency is very large. That's the nature of the development challenge that India faces." Nils Blythe's report from Mumbai is on BBC Radio 4 on Monday 25 February at 1700 GMT. Are cities growing too much?